This is often used in Northern England in Dock pudding, even though it's not a dock leaf as we know it, it is in the higher classification of polygonaceae, though it certainly looks somewhat similar. and the leaves... they are somewhat bitter at this stage though much more palatable when younger and narrower. They can be eaten raw but are better treated like spinach and cooked with a little butter, when I tried it I found the centre rib needed to be removed to make it easier to eat though this wouldn't be a problem when the plant is used when young. 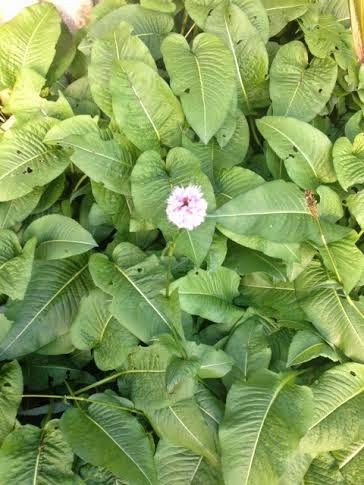 Medicinally the root is a powerful astringent, and is used in the treatment of reducing inflammation in throat and mouth. It is also used in the treatment of diarrhoea and is an effective coagulant. May old grudges be forgot and new bonds forged, and may peace and friendship find a way. 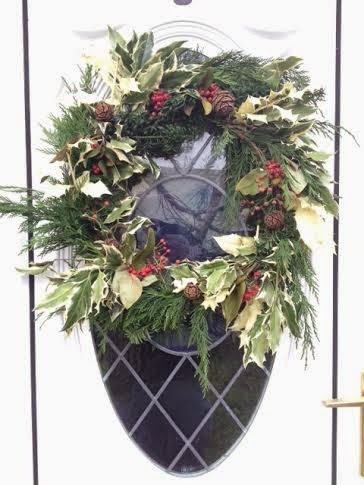 this years wreath was made from dogwood, yew, cyprus, holly, cotoneaster, wild rose and sequoiadendron. It's Dave's newest book and I thought I'd give it a passing review. For those of you who have been watching Dave's videos for years you're not going to find much new material, it's a condensation of some of his knowledge confined into paper format. It follows the standard format for a bushcraft or survival book, taking about tools, skills and basic common sense practise. It's an enjoyable read though for those of us who have been practising these skills for years it's unlikely you'll find anything new or remarkable inside. What it does do well though, is go over the fundamentals that we all take for granted and we really should revisit more often than we do. It's well led out, drawings are clear though basic and information is concisely portrayed. 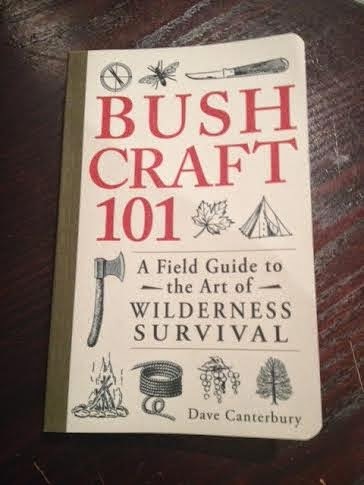 It would be a great book for beginners or preppers who might want to carry one in their B.O.B..
For the rest of us, it's good to see him put his knowledge into the printed word and it will occupy an important spot in your bushcraft library. but look what happened, on both boots, the sole started coming off again.Well that's it for me and Lowa's, for the price they cost and the length of time they last they are definitely not worth it I'll never go near them again.. .lesson learned the hard way! Mora Pro C Robust Knife in the flesh. as you can see the blade is about 3.2mm thick and unfinished so will need squared off for use with a ferro rod, though that's not such a problem. cons?,,, well it's got a damn big gap (nearly 1mm) between the blade and the handle, this has me concerned as to just how well fixed the blade is to the handle. I'm not as worried about the bacteria build up inside the handle as I am about water ingress and this being a carbon blade the ultimate rust that will follow eventually causing the blade to fail, this serioulsy needs to be rectified if this is to be a contender as a field knife for outdoorsmen, it's a pretty big problem that Mora really needs to resolve urgently. I'll fill mine with superglue but it's really something that shouldn't need to be done on a brand new knife. These are great parangs, based on the style Ray used in one of his programs. They are available with wooden or plastic handles, but the wooden ones are nearly double the price of the plastic handled tool, so it's hardly worth it is it? Here they are, very weighty and quite comfortable in the hand, though the point of use tends to be slightly forward of the handle so I think I'll wrap that in tape to make it easier on the fingers. these are hand forged in Bidor in Malaysia, if it doesn't have the stamp with the crossed swords on it then it isn't the real thing.. Their price is incredible cheap but shipping is a killer so if you do order them make sure you get 2 or 3 at a time to make it worthwhile...now I just need a jungle to enable me to put these to use!! 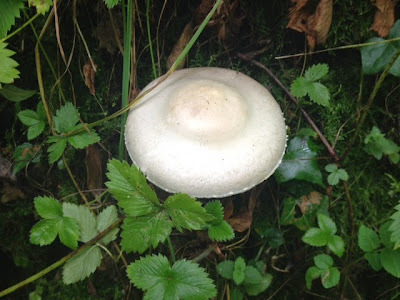 it's a non native originally imported from the Mediterranean as it has mild medicinal properties though it is poisonous to livestock and so I'm sure to us also if not prepared properly. Once used for scrofula and hepatitis and even as an enema, it has fallen by the wayside as a medicinal though it is of great benefit to our native moths being a great plant for Lepidoptera species. The Mora heavy duty, the same style as the basic models released this year but with a thicker blade, that will keep a lot of people happy but for me it still lacks a decent point and the grind is too obtuse, looks good but no cigar. 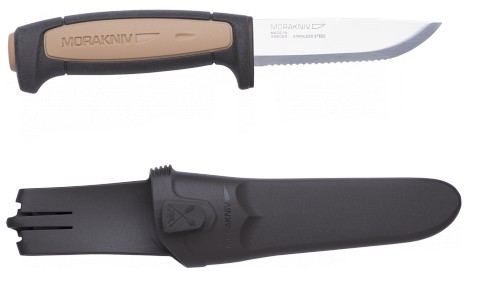 Does the new mora remind you of the knife above ? and the rope version with a serrated blade, there will also be the usual flex blade, chisel point etc, though I think the ones above will appeal most to outdoors men.. 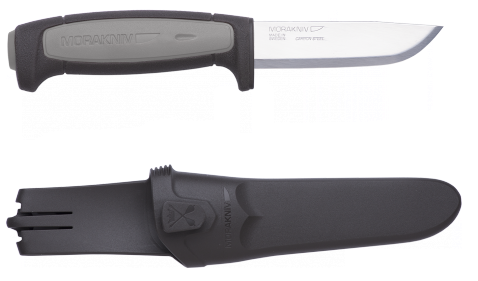 But when all is said and done most people I talk to still want the original 510 back, with the 2,5mm blade, high grind and plastic handle, it was an iconic knife and Mora should really consider bringing it back. often found in hedgerows and open fields, horse muhrooms are delicious and i've often had a great feed of them, but just as often been caught out. If it stains a vivid yellow chances are it's a yellow stainer, it's hard to see in this picture but this was very yellow when cut. if in doubt leave it out. Spearmint, a late season treat. and it was even in flower, though starting to die back a little, here it's easy to see the Spear shaped flowers from which it gets it's name. The scent is much milder than that of water mint but it is really pleasant when crushed and makes a beautiful tea that soothes and relaxes. What a year it's been for fruit, nuts, berries, and general harvest all provided from mother nature. 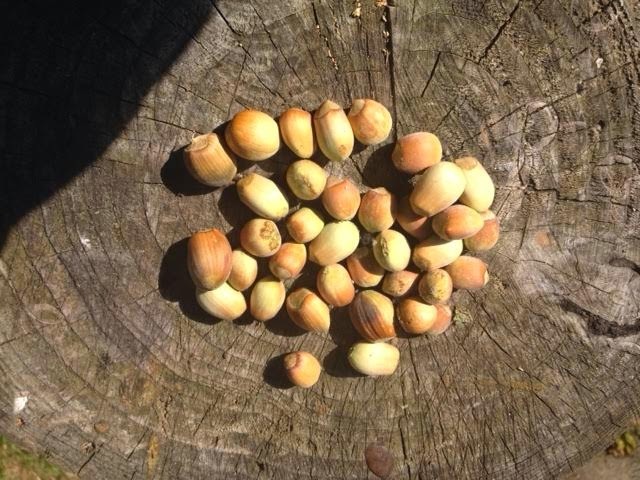 Hazel nuts, these were gathered in the space of 5 minutes from a single branch of a Hazel bush, the best nut harvest I can remember. 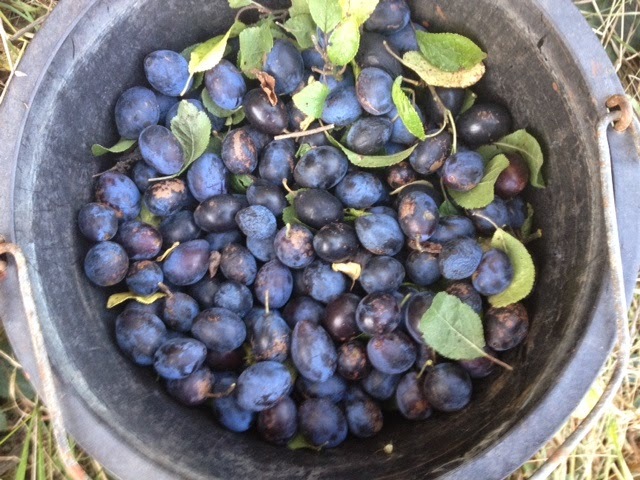 Damsons, this bucket weighed 13lbs and we ended up gathering 3 buckets, from just two trees and that was only the ones we could reach! 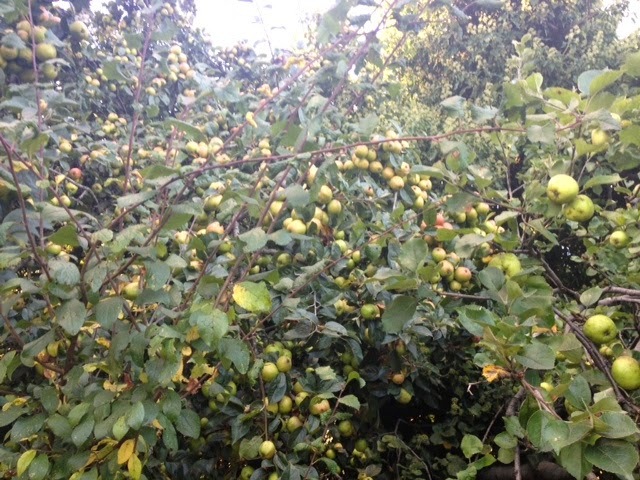 Wild apples, looking at them in a bag doesn't do the size of the harvest justice so here's a pic of a single tree were the branches were so laden they were nearly breaking..
we know a place where the Damsons and Wild Apples grow side by side, so an hours picking resulted in a fruit harvest greater than any I can remember. And the reason for such a substantial bounty? Well the old saying is fine harvest foul winter, the idea being that nature provides such a bounteous harvest to enable all the animals to get through an upcoming deep, dark and cold winter..
Is this year to be a real bad one, low temperatures, heavy snow and hardship for all the animals? Time will tell I guess, but if nature is providing for a really hard winter remember the animals, put food out for the birds, the voles and hedgehogs and all our little friends, they will find it tough enough and I'm sure would be glad of any help we deign to provide them. The little Ikea cutlery drainers are often modded to make great little hobo stoves, however they make a large collander that is great for a small firepit for 2 people in a place that doesn't allow open fires and it also doubles as a decent bbq.. It can cook 4 large burgers at one time, nearly a dozen sausages or two large fish fillets, remove the grill and it works very well as a fire pit, enabling you to use forest floor debris to create a great wee fire that would easily keep 2 people warm, replace the grill and you can fit 2 size 12cm zebra billy cans on it..
it's basically a big brother to the hobo stove!! We've been extremely busy of late, hence the lack of posts on the blog which I hope to remedy over the coming months, with lots of interest from families and kids, as well as groups it's great to see people show such an enthusiasm for bushcraft, foraging and the outdoors. lots of interest, when there was only supposed to be twenty, we ended up with 52 in one workshop!! Most of you who have been following the Buzzard blog for a while will be aware of Davy's and my dislike of Joe Teti, he never should have replaced Dave Canterbury and as you will have no doubt seen Dual Survival has crashed and burned since he replaced Dave. I'm sure you're also very well aware of Mykel Hawke's problems with Teti where there have even been alleged threats from Teti towards Hawke. It now seems that some of these allegations made about Teti are true as Cabelas have just dropped their sponsorship deal with Teti after a number of things have come to light in recent days, it seems Casio, another Teti sponsor, are also thinking of dropping him.. and where is the Discovery Channel while all this is going on? Nowhere, that's where!! They're keeping their heads well below the parapet after all the pomp and ceremony that he was introduced with now has come back to bite them!! Sorry Discovery Channel but there were numerous posts on your site saying Teti was not the one and that we all wanted Canterbury back, you should have listened to us!!!!! Anyway, below is a link describing in better detail a little about what's going on, I'd encourage you to read it and try not to gloat too much.. The link will take you to the Military Times website. It's mushroom foraging time and it's always easy to get it wrong if you're not highly experienced, as a matter of fact although the season has only started there have already been 84 known cases of mushroom poisoning.. Also it's becoming so concerning that the National Poisons Information Service have just issued a press release regarding harvesting wild mushrooms.. I'll not repeat it here in full but would encourage you to follow the link and give the information a quick read over.. remember "if in doubt, leave it out!" The one thing I always carry when I go out is a stick, I've been carrying them for as long as I can remember, all started by my grandfather who always carried one too. However the type of stick I carry now has evolved over my years in the woods to become something particular which I call a Foragers Stick. It's head has some form of a hook to bring down branches or apples, this hook can be antler, horn or wood, but I prefer one carved out of all the same branch so there is no join at all. again, one piece sticks tend to be stronger and more durable but it's entirely up to the maker. I like sticks with dog legs and nobbles, it makes them unique and gives each stick character, I always find that sticks that are as smooth as snooker ques tend to be spiritless..
and sauce added to make a gorgeous blackberry ripple ice cream. 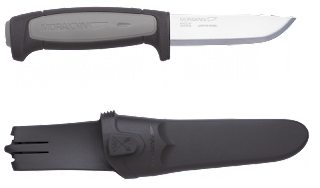 There are 2 differences between the basic model and this one, both easy to see, one being that this model has a rubber cover over the handle and second that the blade is considerably wider that the basic model. when I say rubber, it's not really rubber but the same material that you'll find on lot of mora's, like the robust and companion, it's very comfortable and very grippy, feels good in the hand and looks very well indeed. exactly the same sized handle as the basic 511 and also uses the same sheath, (which is actually quite nice, it's not black but almost a dark gunmetal bronze, looks really well). Again the same thickness of steel, 2mm, but a chunkier blade that makes it feel more resilient and a better bushy blade. It's a nice blade, but this is where the comparisons with Hultafors will start, their heavy duty knife is very similar to the Pro C but with a thicker blade that a lot of bushcrafters would prefer so I guess it basically comes down to personal preference, the thinner blade is nicey slicey, the hultafors heavy duty would be more robust, the only 2 things I would change about the Pro C are I would make the blade 3mm, (with the corresponding deeper grind) and give it a better point, A good point on a bushcraft blade is something that is often overlooked. big chunky handle and the usual blade shape, the blade is 91mm long and 2mm thick, personally I still think the blade is just slightly too thin for this knife. the only thing I will say is that it feels slightly unbalanced due to such a big handle and thin blade but it's still a very user friendly knife. you can see the scale in my hand here, I do think like the older 511 models that it would be a more comfortable user if the front guard was taken down a bit, but as we all know this will give problems with sheath retention.. 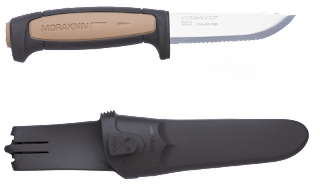 Still, a very cheap knife and a good user, I can see it becoming a bushcraft favourite.